“Seaside Summer I’ was created by the Ukrainian artist Vitali Bondarenko as a part of his “Seaside Summer” series. 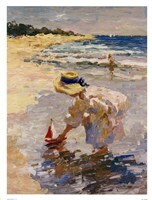 This image features a young woman walking on the shore. She’s shown from the back, wearing a knee-length white dress and a straw hat with a blue ribbon wrapped around it. There’s a basket of fish, shells or other findings to the left of her. This artwork was created in Bondarenko’s classic impressionistic style with pastel waves in blue, purple, pink, green, beige and white. The attention to detail and elaborate brushwork in this piece create a serene scene that will remind viewers to reminisce about quiet days at the beach in a simpler time. This piece is a great addition to any beach house or beach themed décor, with a white frame being the most popular finishing choice. A brown or cherry frame can also work to add a beachy feel to other décor styled rooms and homes.